After taking some time out and doing some writing, studio work and engineering, amongst other things, Trevor was persuaded to get back into recording and performing and is currently working with Chase Encounter and doing what comes naturally. His songs are mostly about his life, experiences and feelings… From the heart………and it shows. 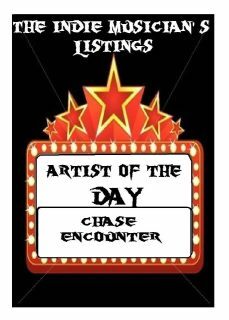 Chase Encounter are an exciting line-up of some of the musicians that Trevor has worked with over his time in and around the music business. The music is based around Trevor’s song writing and ‘Southern’ rock and country influences. They are with out doubt a talented, powerful and exciting band. If you like strong rhythms and meaningful lyrics, they are what you’ve been looking for. The tracks here are just a sample of the Chase Encounter repertoire. If You Like The Music Of Chase Encounter, Please Buy It ! !